Besan is creating a buzz in health industry. Not just because of its yummy taste and versatility in cooking, but also because of its gluten-free status and high protein content. Besan is one of my favourite cooking ingredients too. I have grown up eating delicious dishes made out of it such as bhajia, cheela (pancakes) and ladoo. Besan is also an important beautifying ingredient. For centuries, men and women from Northern India have used besan to beautify their face, body and hair. 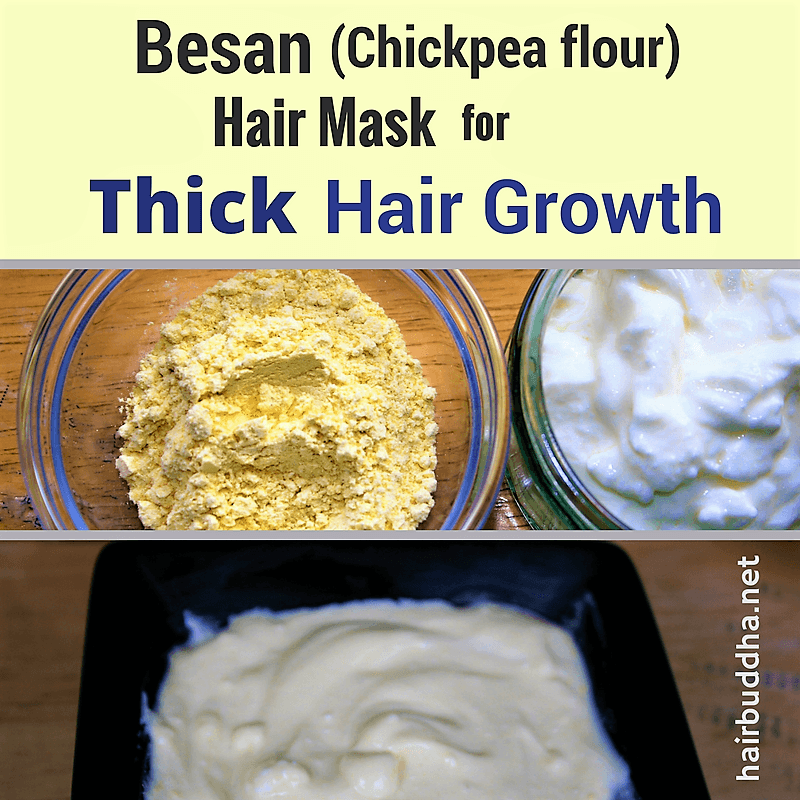 I have always used besan for face but didn’t know how amazing it was for the hair. My brother-in-law, who grew up in Bihar, told me applying besan on the hair was a Sunday ritual in his family. Before bath, he and his siblings got a head massage followed by besan mask to nourish and condition hair. These rituals also meant that all members of the family got together to spend quality time laughing, sharing and passing down the ancient ayurvedic wisdom of food, health and work. The besan hair mask certainly did some magic as my brother-in-law has thick, black, shiny hair and no grey hair in appearance even in his late thirties. Besan needs no research or lab animal studies to prove the point. The thing is when you head massage and put the right herbs (tested by generations) on your hair, it creates healthy hair follicles which then promotes strong and lush hair growth. Besan is literally like a multivitamin for hair. It’s rich in antioxidants, folic acid, iron, copper, zinc, magnesium, selenium, and niacin – all of these nourish hair follicles and improve growth. Besan also contains extraordinary amounts of antioxidants which protect the hair from damaging effects of free radicals. While the high amounts protein helps to nourish the hair and combat hair loss. The other bonus ingredient in besan is molybdenum – this supports the scalp tissue and surrounding hair follicles so the hair has a strong foundation to grow from. After the much loved miracle hair mask, I am excited to share another hair mask that is very popular in the Indian culture. 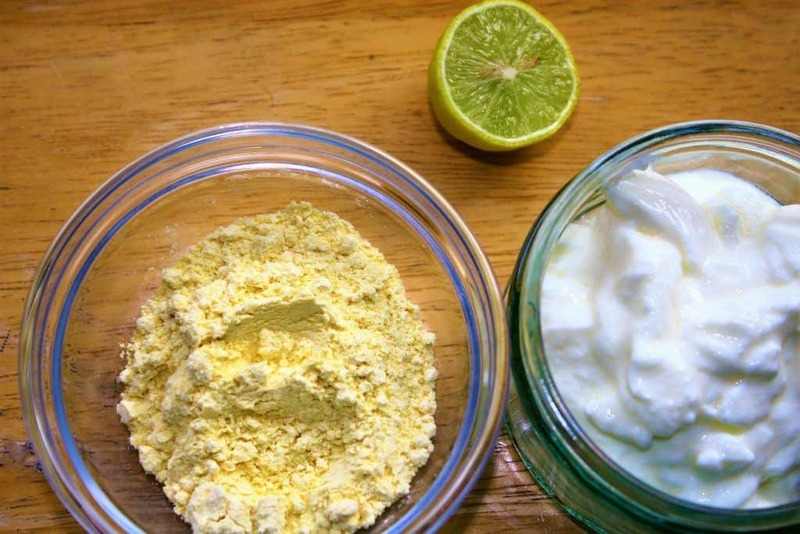 The protein-rich besan is combined with yogurt and some lime juice to make an ultra-effective hair treat. Yogurt contains lactic acid for exfoliation and moisture. It also has tons of healthy bacteria to help reduce inflammation, hydrate and protect your scalp. While lime juice is rich in vitamin C and helps to rejuvenate the scalp, as well as add luster to your hair. Lime also has antiseptic and antifungal properties that help with dandruff. Place besan, yogurt, etc., in a bowl and mix well. You can add 2-3 tablespoons of water to thin out the mixture. Start with damp or dry hair. Apply to your hair, from root to tip. Place a shower cap or wrap an old towel and let the mask soak in for 15-20 minutes. My favorite way to use the mask is to apply it while in a warm bath: it’s relaxing and makes for easy cleanup! Next, rinse out and shampoo as usual. If your hair feels soft and clean, you don’t need to condition. But if it does, apply your choice of herbal tea to condition hair. This will get rid of besan bits and also make your hair shiny. Use green tea for oily hair and hibiscus or marshmallow for dry hair (more ideas here). Enjoy your thick, shiny, beautiful hair. Use besan as your everyday face and body cleanser. You can even use it as a skin brightening treatment or anti-aging face mask. For smooth and baby soft skin, mix besan with milk/yogurt and use as a body scrub. When there was no face wash, there was besan. The slightly gritty besan can be used as an everyday face wash to remove deep-seated dirt and refresh complexion. I also like add things like turmeric, licorice and fullers earth. 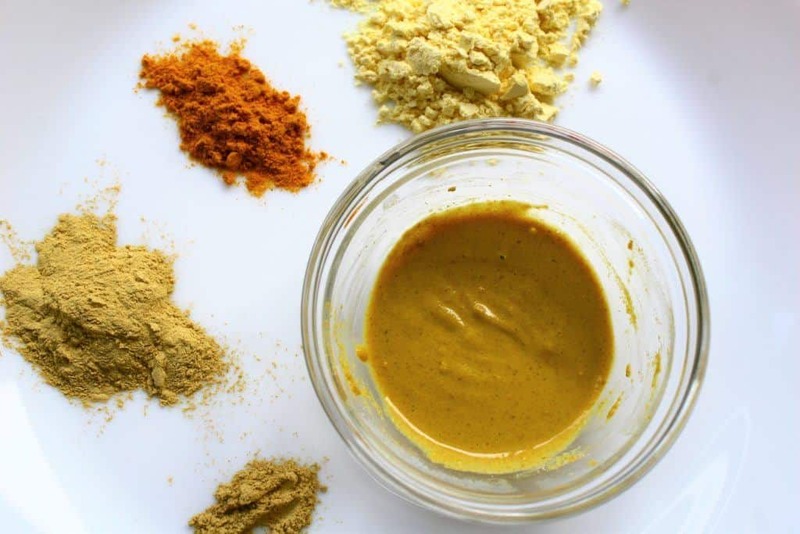 Turmeric offers excellent healing properties and provides smooth and glowing skin. Licorice is useful in skin conditions like eczema and also helps to keep the skin soft and hydrated. Mix the above ingredients in a small bowl to create a liquidy paste. Some people like to use milk instead of water (you can do that if you have dry skin). Gently massage on the face in a circular motion. Keep it on for a minute or so and rinse with water. Use every day or every second day. My tip: After you wash your face and pat-dry it, apply 2-3 drops of almond oil on your face and neck. This will brighten up your skin instantly (without any nasty chemicals). This classic face mask is a must try if you desire soft, clear and glowing skin. Besan contains tons of antioxidants and zinc – both of these help to rejuvenate skin, even out complexion, as well as protect it from oxidative damage. Traditionally, bride-to-be applied this mask every day for a month before the wedding. But you can use it even if you are not getting married, or are already married, or whatever your status is. This mask is suitable for all ages, and you can use it as an anti-aging face mask too. 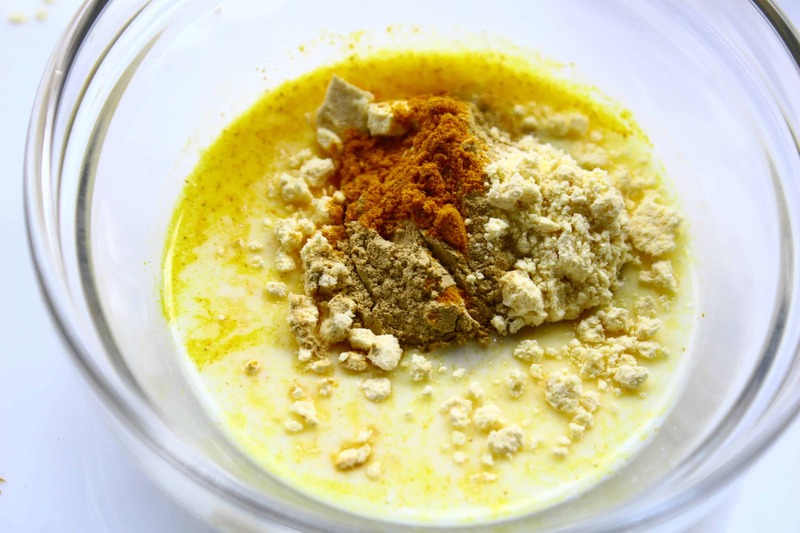 Combine the besan with milk (and other ingredients) to make a smooth paste. Add more milk if needed. *you can use bentonite clay or kaolin clay in place of fullers earth. Apply evenly on your face and neck and let it sit for 15 minutes. Wash it off with water. Next, follow with 2-3 drops of almond oil. Note: Turmeric may stain your skin, first test it on the back of your hands before using on your face. You can replace turmeric with wild turmeric or kasturi turmeric which doesn’t stain. 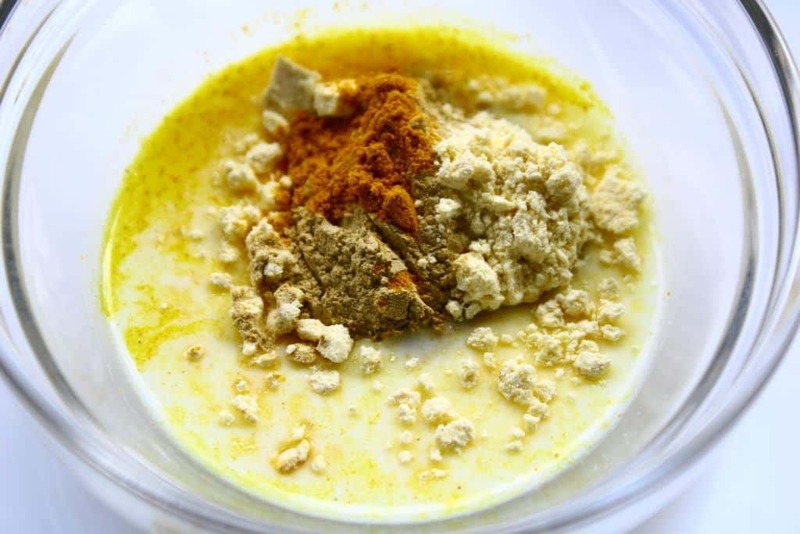 Besan makes a fantastic scrub for your body. It helps to exfoliate the dirt and unwanted dead, dull skin cells to uncover fresh, bright new skin. Combine well the above ingredients in a bowl to get a paste. Feel free to add some water to make it paste-like but make sure it doesn’t turn watery! *If your skin is on the dry side, use milk or milk cream instead of yogurt; or you can combine both. Gently massage besan scrub into your skin using circular movements. Let it sit for a few minutes, and then rinse off. You can include the super-nutritious besan in your diet. Make besan cheela or pancake from it– there is another fancy name for it ‘vegan omelete’. Also, besan counts as one of five a day (fruits and vegetables) according to UK nutritionists. So another reason to celebrate besan! You can find besan in any Indian shop. You can also buy it online (click here to buy). To have great skin and hair, you also need to work on the inside. Be sure to drink water, avoid processed and junk foods, eat lots of fruits and vegetables, exercise, sleep adequately, and think and feel positive! 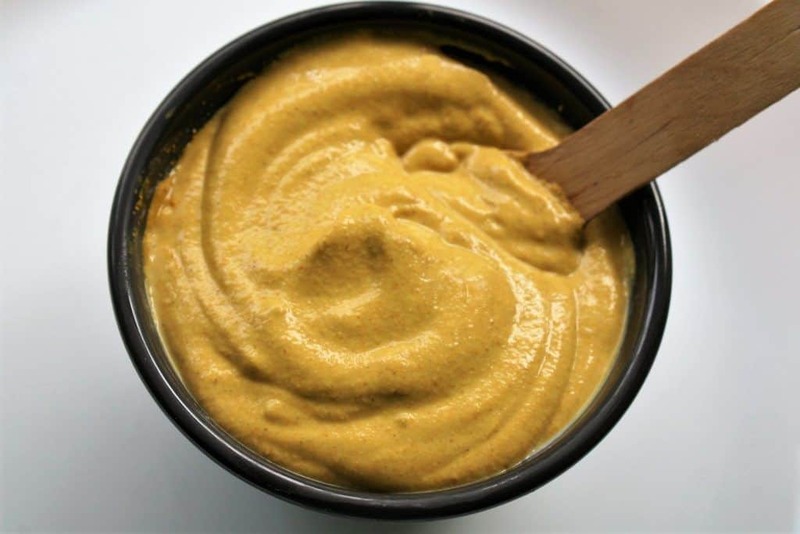 Do you use besan for your hair/skin? Share your experience below! Previous Post How To Make Conditioner At Home (With One Herb) Next Post Does Stress Cause Hair Loss? I dont get it…you are offering all these beautiful natural ways yet still mention shampoo? I have used besan instead of shampoo..and it was lovely–.isn’t that the whole point.of this article? Good to hear the recipe. I have a question, I get small acne-type thing on my scalp, which gets ichy. This has led to a great hairfall. Do you have any remedy to treat the ichy scalp? Application of vitamin C might do more harm, however, I am not sure. I am surely going to try out this recipe and will get back with my opinion. Thanks for sharing! Looking forward to hearing from you! Hello friends, my daughter aged 12 years was having a severe hair fall problem. Her hair are dry and a bit curly. Then i came across hairbuddha, read the suggestions and have started the following regime for her hair. after a month of use, her hair fall has reduced to 5-10 strands a day. Besides, hair are shiny, easy to manage, no dryness and very little dandruff. I massage her hair with oil i.e. a combination of mustard, coconut, castor oils alongwith methi seeds and kari patta leaves. After 1-2 hours i wash her with yoghurt, besan and methi dana mixture. This is done once a week. No shampoo, no conditioner. By the end of 6th day i.e. saturday, hair fall increases a bit say around 15-20 strands but overall the change is amazing. Thank you Minaz, for your practical and useful suggestions. I´m confused about the besan. I thought, besan and turmeric is a traditional Indian method to REMOVE HAIR? So can it do both? Yes you are right, besan and turmeric is used to remove hair. Turmeric helps with that that is why you don’t put turmeric on your scalp. You can use the face cleanser or face mask recipe. Gently scrub your face, repeat 2-3 times a week. Hello I was wondering do you have any Recipes with out using yogurt, milk OR eggs in your products or is there anything I can substitute those items with to make it a vegan product. Yes of course, you can use coconut milk for hair. Use almond flour for face. I use besan face mask weekly. It makes my skin soft, clear, bright. Love all the info here. I have been using amla oil for hair loss, and will try this mask too… Where do I purchase it? In a grocery store? Hi Jane, you can buy it at any Indian store or it’s also easily available online. Thanks Nancy, look forwards to hearing more from you.